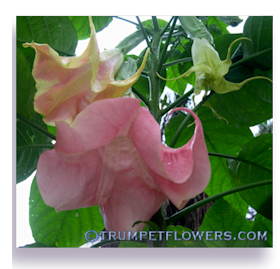 This month I am going to post a little early, because everyone is asking about brugmansia seed pods and when and how to harvest and grow the Angel Trumpet seeds. Brugmansia seed pods are firstly, easy to make if you have at least two different cultivars. Sometimes they get pollinated by bees, but Angel Trumpet seeds usually produce better babies if you pollinate them yourself. If you already have some seed pods, and want to know if they are ripe enough to open, you can check them with an exacto knife first. Usually when they are green, or all white, they are not ripe enough yet. 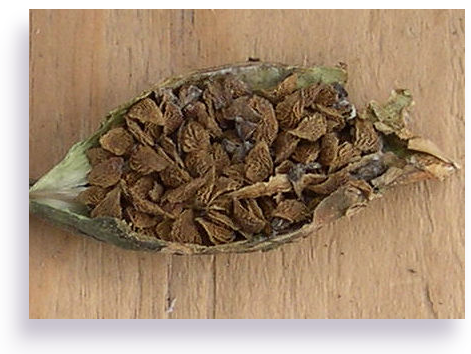 If they are not ripe, reseal the slit you made in the seed pod with wax or some duct tape. If they are ripe, they will look semi-brown to brown. Brugmansia crosses that are made in the fall can have ripened seed pods by the next spring, but usually take longer. Brugmansia crosses that are made in spring can be ripe by fall. You know a pod is ripe when it turns a bit mushy, and may begin to discolor, or look splotchy. Some pods can take over a year to ripen, a lot of this depending upon your climatic conditions. If you live in a place where you get frosts, you will need to bring the mother plant with the seed pod attached to it indoors. Brugmansia, as well as her seed pods, cannot withstand frosts. 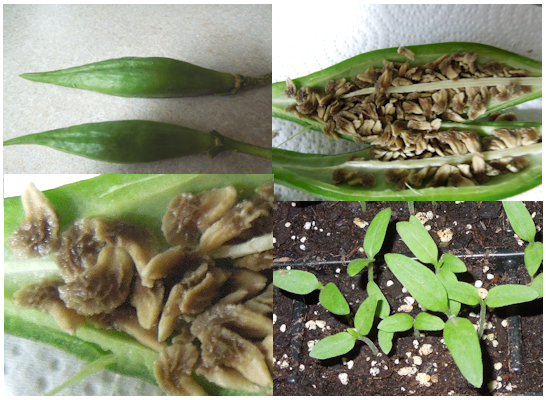 Brugmansia seeds remain viable for many years, up to seven I&apos;ve been told by other growers. If you are just planning on storing them, make sure to let them dry out a bit first, by spreading them out on a paper towel and letting them air dry. This will ward off fungus, which would kill the seed&apos;s ability to germinate. You can dust them with a little bit of cornstarch. Cornstarch will help stop seed mold. After they are dry store them in an empty pill bottle or plastic snack bag, making sure to label them as to year harvested and the cross, if you know it. If you want to, you can go ahead and try to germinate some of them right after a successful harvest. Fresh seed may come up in 7 days, or take up to a month, it just depends on climatic conditions, temperatures, or even the cross of the seeds themselves. Here&apos;s an interesting point about Angel Trumpets and their seeds. Brugmansia (warm group) are clones, so if you want the double blooming Fleming Island Rachel, (as an example) you would have to take a cutting of her and grow the cutting to get a duplicate. Seeds of brugmansia do not come true from the parents. The odds amongst brugmansia seeds are that out of every 10 you grow, 9 will be white single blooms and the 10th plant may have color, or be a double. This unusual one you grow out may be different enough to consider registering it. That is, if it doesn&apos;t look like another already registered cultivar, and there are thousands of those. Some brugmansia are actually true species, not cultivars, and can be grown true from seed. Cold Group Brugmansia sanguinea is one of those. If you want to try and grow some out for fun, or are more serious about growing them for the purpose of creating a new and lovely Angel Trumpet cultivar, then by all means get going on creating your own crosses. There are certain cultivars that are already known to throw better genetics than others, and so Brugmansia Hybridizers always have these cultivars in their collection. A few I know of in the states are Luminosa X Charleston, Jacayna, Joli, and Sam. There are also cultivars that do not do well in a breeding program, or are at least harder to get to accept pollen. Langenbuscher Garten is one of these. Although he himself is drop dead gorgeous, he is very hard to use as either the mother or father of in a hybridizing program. One flower he has been known to cross with is Bernstein. Bernstein of course, was the mother flower. The successful cross was Wuppergold. I hope I&apos;ve cleared up some of the questions asked me about brugmansia seed pods and when they are ripe, etc. 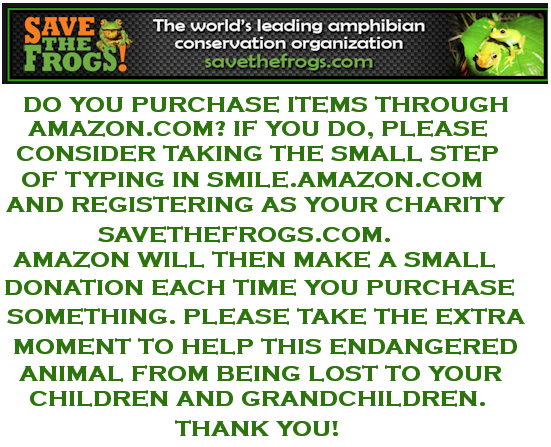 If you still have questions I&apos;ve forgotten to answer, please feel free to email me. My email is on the bottom of every page. 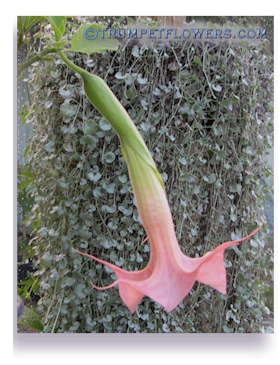 This entry was posted on November, 2013 and is filed under Brugmansia Blog.